Imprisoned for a murder he didn’t commit and betrayed by those closest to him, Dean Weston struggles to stop the genocide of newly discovered energy-based life forms so unique they cause humans to acquire extraordinary intelligence for a brief period following exposure. As genius edges toward insanity for those exploiting the peaceful entities, a ruthless experiment goes awry leading to the creation of an evil capable of redefining human existence. Joanne Elder is a member of the Professional Engineers of Ontario. She received her Bachelor’s and Master’s degrees in Engineering Science at the University of Western Ontario. During her professional career, she spent several years in the aeronautical and nuclear industries, published numerous technical papers in the field of Metallurgic Engineering and presented at international conferences. She now resides in King City, Ontario with her two teen-aged children and husband. You can visit Joanne Elder’s website at www.sciencefictionthrillers.com. During my engineering career, I published many technical papers. Never did I think my love for science fiction would pull me to write in that genre, but it did. I feel fortunate, as few people stumble upon an unexpected passion as I have done with writing. It’s an incredible thing to discover a born talent within you and run with it. What was your inspiration for Spectra? Often science fiction plots involve extraterrestrials carrying out ruthless experiments on humans. I loved the thought of switching it up and stirring in some deadly consequences for those immoral enough to exploit a newly discovered, peaceful and intelligent life form. I love to explore the “unknown” and science fiction is the perfect avenue to do that with. As we know from the past, today’s speculative fiction may become tomorrow’s scientific fact. A subplot in Spectra narrows in on the human soul and what it is. Scientifically speaking, if it exists, it has to be something. So does God for that matter. I carried out a lot of research into the human energy field. In particular, a study done at UCLA where it was actually measured, thus proving that we have an “aura.” I also researched dark plasma theory to model the energy life forms in Spectra as plasma life, which, interestingly, could well exist. 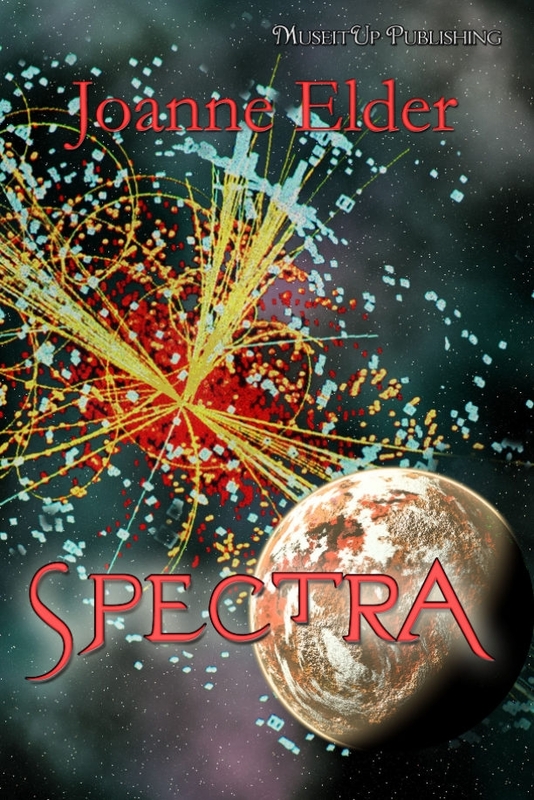 Spectra is fiction, but real science does support the existence of energy based life as portrayed in the book. It took just under a year to complete Spectra. I’m extremely disciplined. When I’m writing, I become fully engaged with my story. I like to write first thing in the morning as I find I’m more creative when I’m fresh. If I get a dose of writer’s block, I take my dog for a walk. That usually cures it. The scientific research I did for Spectra was fascinating and intriguing. The challenge was to take this research and convey it in a completely non-technical manner so it would be thought provoking for the reader but not confusing. I love the creative aspect of writing. Writing is complete escapism and I enjoy it even more than reading a good book. I’m published with MuseItUp Publishing, a small press. I was able to submit to them without using an agent, who would have been entitled to a percentage of the royalties. MuseItUp is a fantastic publisher and I’m very pleased with them. From the author’s point of view, small presses have many advantages such as the ability to put forth ideas for the cover art etc. My website is www.sciencefictionthrillers.com and my facebook page is www.facebook.com/Spectra.Series. Follow me on Twitter @JoanneElder. 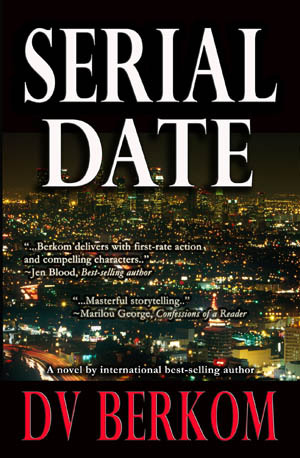 In an unexpected turn of fate, former assassin Leine Basso is offered a job working security in Los Angeles at a gigantic hit reality show called Serial Date–where beautiful young women get to date ex-cons posing as serial killers. Though L.A.brings her bad memories, Leine can’t just ignore $2,000 a week, especially when she needs the money. Soon, the police find a letter supposedly written by the killer, a letter that reveals a very focused agenda. Then, Leine’s daughter is kidnapped by someone claiming to be the killer. Leine hasn’t seen her in years because, unfortunately, her daughter doesn’t want her in her life–a fact that tortures Leine every day of her existence. In order to find her daughter, Leine must use her skills as an assassin and come to terms with her own identity, something that secretly terrifies her. Soon, a grim picture emerges: is the killer someone from her past set on revenge? I thoroughly enjoyed Serial Date. The author has a distinct style that is witty, smart, and darkly humorous. The prose is sharp and gritty. I love satires and this one was no exception. I especially enjoyed all the subtle, indirect criticism of television and reality shows. I kept chuckling as I read. The story is told in multiple points of view separated by chapters, so there’s no distracting head switching. The pace is pretty quick with a fair share of exciting twists and turns. To add more flavor, Santiago and Leine provide a sprinkle of romance. I have to admit, though, that the fact that Leine was a former assassin bothered me a lot in the beginning, even though the author stresses the fact that she killed criminals. I kept wondering if I was going to forgive her for that. Surprisingly, I did. Leine comes out as a very human character who is deeply sorry about her past and who wants to reconcile with her beloved daughter. This emotional subplot about her and her daughter really brought the story to a higher level for me. Another thing I need to point out, just for those sensitive readers out there, is that there’s a lot of foul language. In short, I highly recommend Serial Date to those who enjoy murder mysteries with a touch of satire. For more about the book visit: Amazon.com, Barnesandnoble.com and Smashwords.com. Please welcome my special guest, romantic suspense author Kaylin McFarren. I recently had the chance to read and review her latest novel, Severed Threads, and I have to say it is an entertaining, thrilling read. Kaylin was generous enough to take time out of her busy schedule to answer my questions about her book and her writing. I hope you’ll enjoy the interview! A native of California, Kaylin McFarren has traveled around the world and is now settled in Oregon. As the director of a fine art gallery, she assisted in developing the careers of numerous visual artists who under her guidance gained recognition through promotional opportunities and in national publications. 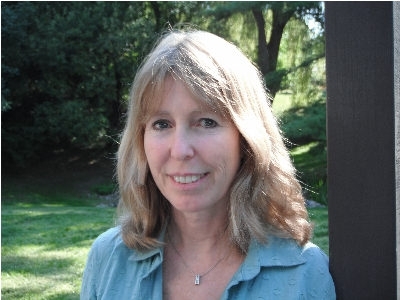 Eager to unleash and develop her own creativity, she has since channeled her energy toward writing novels. As a result, she has earned more than a dozen literary awards and was a 2008 finalist in the prestigious RWA® Golden Heart contest. She is a member of RWA, Rose City Romance Writers, and Willamette Writers. Thanks for this interview, Kaylin! Do you consider yourself a born writer? Definitely. Since the age of eight, I’ve loved to write stories and have been filled with an active imagination. What compelled you to start writing professionally? Like many authors, I was originally inspired to write my first novel after reading a great book and seeing an amazing movie. Mine happened to be Memoirs of a Geisha and The Notebook, which will always be my favourites. Severed Threads is full of romance, suspense and danger. What was the most challenging aspect of writing this romantic thriller? The most difficult task to writing a suspense story is to keep the action moving while revealing character traits and emotions along the way. Severed Threads contains an array of characters and each serve their purpose in revealing a twisting and turning plot that ultimately leads to a pleasant resolve. However, keeping the voices of each person unique also proved to be a challenge. Tell us something about your hero and heroine that my readers won’t be able to resist. Chase Cohen is a handsome, womanizing, thrill-seeking treasure hunter who has found his greatest challenge and true love in Rachel Lyons. But she doesn’t trust Chase for good reasons and won’t be easy to win over.no matter how hard he tries. What did you find most fascinating while researching underwater archaeology and ancient Chinese treasures? I had no idea how much gold had been lost at sea. According to Greg Stemm, co-founder and co-chairman of Odyssey, there’s billions of dollars scattered beneath the ocean. However, much of the ocean floor is unexplored and unmapped and global imaging shows crushing depths ranging up to six miles. And there could even be gold or diamond mines that far surpass what anyone on earth could imagine. Since trade included priceless collectibles and dishware from China as well as gold and silver, these were lost along with ships that sank during storms and battles hundreds of years ago and many will never be recovered.at least not in our lifetime. How long did it take you to write the novel and did you work from an outline? It took me close to two years to write Severed Threads. This included the time needed to research details and edit my final manuscript. I typically create a synopsis and then write by the seat of my pants. I’m not big on storyboards and planning, as I’m too anxious to get my stories on paper. Although I tend to edit as I go, I eventually asked three published authors and two experienced readers to assist with my initial editing before hiring a professional editor to review my manuscript. After taking all of their advice into consideration, I fine-tuned my writing and sent it in for publication, hoping I’d done my best in creating a fast-paced, entertaining tale. What advice would you give to first-time novelists who are just starting to market their books? Spend a little extra time in researching your options. If you chose to approach a publishing house, be sure the agents you contact are experienced in your genre and have a great track record. If you decide to self-publish, be prepared to spend a little extra money and time in promoting your titles as well as yourself. What’s on the horizon for Kaylin McFarren? I’m currently completing the second book in the Threads series – Buried Threads – and will be following this with a third – Banished Threads. I’ve enjoyed my characters so much in my first installment that I decided to take them on adventures around the world and have been urged to do so by readers who follow my stories. Keep reading and if you enjoy the work created by an author, be sure to let them know. Your praise and support encourages every author to write! Find out more about Severed Threads on Amazon. The story opens during a diving salvage operation with experienced divers and treasure hunters Sam Lyons and Chase Cohen. Though they’re working on the Griffith wreckage, Sam believes the site also contains the wreckage of none other than the Wanli II—the Ming Dynasty Emperor’s lost dragon ship containing an ancient figure head, a fierce dragon in gold leaf and preserved in resin for all posterity—the gift Mai Le intended for her lover. Unexpectedly, however, things turn bad for Sam while he’s underwater: he suffers cardiac arrest for no apparent reason. Indeed, the circumstances surrounding his death appear more than a little mysterious. Chase, who had loved him like a father, feels responsible and doesn’t know what to make of it. Did something malfunction or did something scare Sam down there? He’d been an experienced diver with over 20 years of experience under his belt. What had Chase missed? Sam was the only man Chase had allowed himself to trust. He and his daughter Rachel were the only two people he really cared for. But now all had changed: Sam was dead, and Rachel would forever blame him for his death. Move four years forward. Rachel Lyons, Sam’s Daughter, is working at a grant foundation. All is pretty quiet and routine in her life…until she’s approached by a museum director asking for a grant to conduct another diving salvage operation, run by none other than Chase’s Trident Ventures. Though Rachel has no intention of helping Chase, Chase is set on convincing her. Since the operation focuses on discovering the Wanli II, if they succeed, her father would receive his long overdue reward and the museum would fund a permanent exhibition to honor his memory. Yet, Rachel is still hesitant. Then, a twist of fate puts Rachel’s brother in danger, forcing her to change her mind about funding Chase’s project. Chase is more than suspicious about her sudden change of heart, but he isn’t about to say no to this opportunity which could help him leave his mark upon the world as a renowned treasure hunter. Thus, she grants him the money and insists on joining the underwater expedition. Can she put aside pride and work with Chase on a daily basis? Severed Threads is an engaging, entertaining read! I’ve always enjoyed stories about lost treasures and underwater archaeology and this one didn’t disappoint. The hero and heroine are realistic and sympathetic and there’s a sizzling chemistry between them. The plot is believable with a fair share of exciting twists and turns. I found the workings of a grant foundation and a diving salvage operation quite interesting and informative. Pacing is fairly quick with a nice balance of action, dialogue, description and the inner thoughts of the characters. 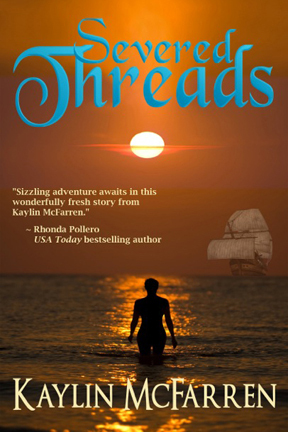 In short, Severed Threads is an exciting novel featuring danger in the high seas, romance, action and adventure, murder, and even a sprinkle of the paranormal for good measure. Recommended. John Knoerle began his creative endeavors in the early 70s as a member of the DeLuxe Radio Theatre, a comedy troupe in Santa Barbara. He then moved to LA and did stand-up comedy, opening for the likes of Jay Leno and Robin Williams. Knoerle wrote the screenplay Quiet Fire, which starred Karen Black, and the stage play The He-Man Woman Hater’s Club, an LA Time’s Critic’s Choice. He also worked as a staff writer for Garrison Keillor’s A Prairie Home Companion. Knoerle moved to Chicago in 1996 with his wife Judie. His first novel, “Crystal Meth Cowboys,” was optioned by Fox TV. His second novel, “The Violin Player,” won the Mayhaven Award for Fiction. John Knoerle’s novel, A Pure Double Cross, was the first volume of a late 40s spy trilogy featuring former OSS agent Hal Schroeder. The second volume, A Despicable Profession, was published in 2010. 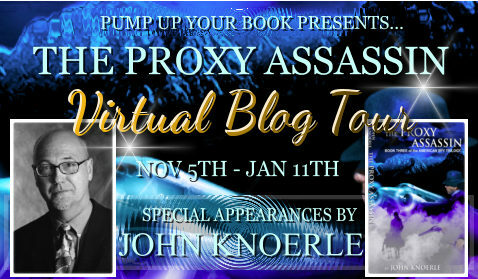 Knoerle’s latest book, The Proxy Assassin, Book Three of the American Spy Trilogy, has just been released. October, 1948. Former OSS agent Hal Schroeder gets an invitation to WashingtonD.C. from Frank Wisner, who heads the CIAs new covert ops division. Hal is whisked off to Wisners Maryland shore retreat and introduced to a brace of Romanian royals, including the scarily beautiful Princess Stela Varadja, a direct descendant of Vlad Tepes Draculea. Then Frank Wisner pops the question. Would Hal consider parachuting into a remote mountain camp to meet with the leader of a group of Romanian anti-Communist guerillas? Hal had already survived two previous suicide missions and a third did not appeal. But he told Frank Wisner he would need a few days to think it over and had some sightseeing to do. As it turns out, Hal gets to do a lot more sightseeing than he bargained for. Proxy Assassin is a journey that brings the American Spy Trilogy to a surprising, and emotional, conclusion. My mother, at eighty-eight years old, still cranks out articles for The Almanac in Palo Alto, CA, as she has for decades, so I have some ink in my veins. But I do believe that writers are made, not born. It’s plain hard work. Whoever said, “Writing is rewriting” had it right. The idea that the story, in all its intimate detail, will pour forth in a booze-and- nicotine-fuelled fury like Kerouac’s “On the Road” is pure fantasy. In fact, Kerouac had taken reams of notes during his cross-country trek before he cranked out OTR in three weeks in April of 1951. 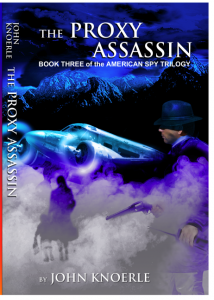 What was your inspiration for “The Proxy Assassin: Book Three of the American Spy Trilogy”? Book Two concluded with Hal Schroeder pretty much single-handedly preventing World War III. Tough to top that, so I decided to paint a deeper and richer portrait of American espionage in 1948, the beginning of the Cold War. But what was my hook? Extended research uncovered a fascinating character. A Romanian Princess, a direct descendant of Vlad Tepes Draculea, who had an affair with the head of the American OSS station in Bucharest during WWII. To this day I have seen only one photo of her, on a Paris train platform in the company, of all people, of Sigmund Freud! She looked like what you would expect a descendant of Vlad the Impaler to look: dark-eyed and scarily beautiful. Princess Stela Varadja was my inspiration. Duplicity in the service of country. Pretending to be someone you’re not. Lying, mendacity and prevarication. Who isn’t interested in that? Also fame. Fame that is not sought but thrust upon you. How that can split a person in two. It took me four years to complete this novel. And it took me ten years to complete The American Spy Trilogy. I am now sixty-three years old. Still feisty, still engaged, but let’s face it, this trilogy will be my legacy for better or worse. I hadn’t thought it all the way through, my Spy Trilogy. It just wasn’t possible to peer that far into the future. I faced the monumental task of trying to thread it all together. Why had 19-year-old Hal Schroeder been plucked from obscurity to become a behind-German-lines OSS agent in WWII? Why did he keep pursuing his spy career despite his better judgment? Would he keep signing on to suicide missions, or finally tell the higher-ups to get stuffed? Beethoven, when asked what he liked most about music, replied that music could make people do things. Music could make people dance, march off to war, weep tears of joy or tears of sadness. Or so the legend goes. The dirty little secret of creative types from low (me) to high (Ludwig), is that we are all control freaks. We enjoy making people do stuff. Whether dance, march or cry. I have been self-published for many years after an unhappy experience with an ‘established’ publisher. It is the only way to go if you are interested in maintaining creative integrity. M.R. Dowsing lives in London, where he writes for the music magazines R2 and Bucketfull Of Brains, performs original songs under the name Hungry Dog Brand, and puts on a regular music night called Dogfishtrombone. He holds a BA in Studies In Contemporary Writing. By day he works as a bookseller. The Assassination Of Adolf Hitler is his first novel. He quit his bookselling job in order to have time to research it properly and, luckily, managed to get his job back a year later before starvation set in. He hopes to be able to quit again soon in order to complete a sequel. His first name is Martin. Your book has a fascinating premise. How did you come up with the idea? I don’t actually remember what triggered the idea, but I do remember that around five or six years ago something made me think that it was strange that no-one had used the idea of travelling back in time to kill Hitler as the basis for a novel. It seemed like an obvious winner to me, so I filed it away in my head and kept my mouth shut about it. Every now and again I would give it some thought and, at first, I began to feel that perhaps it was not so strange that it hadn’t been done, because it was quite a problematic concept; it could involve years of research to do it well, and there were so many different directions it could spin off into… Eventually, though, I felt that I was beginning to see a way in which it could be contained somewhat and, three or four years after I first had the idea, I finally talked myself into writing it. I’ve very recently found out that Stephen Fry used a similar premise in Making History, a book that I was unaware of, but it seems like a completely different approach to mine, so I don’t think it’s a problem. Time-travel and Hitler is an interesting combination. Does that make your novel a historical fantasy? I suppose you could call it that. I think of it as a historical thriller which happens to use a science fiction device. What type of research did you have to do for the novel? Lots of research about Hitler and the beginnings of the Nazi party, in particular. Quite dark stuff, some of it, and it was a bit of a relief when the book was finished and I could read about other things. Also, quite a bit of general research on the periods in question. Some of the research was quite enjoyable, though – I enjoyed my visits to the British Library to look at old maps and such. I also visited quite a few of the locations used in the novel, which was both interesting and valuable. I had to keep thinking about what would have been there when the story was set and what wouldn’t. One trip was a bit rough though – the weather was brutal and I came down with the worst cold I’ve ever had so that I couldn’t even sleep at nights! Well, I should point out that I left my day job as a bookseller in order to write it. If I’d been working as well, it would have taken much, much longer – if it had have happened at all. I forced myself to write a thousand words a day and, after about three months, I had something like a first draft. I then spent another three months rewriting it over and over again and adding detail. After this, I still occasionally went back into it and changed a few things. Did you plot the book in advance? If yes, how did you go about it? I actually just had what might be called the “arc” of the story in my head, and then just worked it out as I went along. I think if I had have planned it all out in advance I would have ended up deviating considerably from the plan anyway. I think in some ways you have to follow the characters and discover what the story is yourself rather than writing characters to fit into a pre-conceived plan. Probably making the time travel aspect work. It gave me headaches and I’m still not satisfied with it! I read a book called How To Build A Time Machine by Paul Davies, which is about how a real time machine might work. I realised that I couldn’t possibly use any of it or I would get bogged down in scientific gobbledegook. I’m not sure I have a favourite scene as such, but I think the section set in Munich is the best part. I have a favourite character, Steiner, who was created on the spur of the moment. I still feel like I want to find out more about him, so I’m hoping to feature him more prominently in a future book. Tell us about your main character and what makes him compelling. Michael Lear is a well-intentioned man who has suffered a personal tragedy in the loss of his parents. In some ways he’s very well suited to the task of going in back in time to kill Hitler but, in other ways, he’s completely the wrong kind of person. This means that during the course of the story he has to become a different person, and adapt to strange and unexpected situations very quickly. I understand you also write for magazines. What is a typical writing day for you and how do you balance your two types of writing? Well, I’m back working as a bookseller again now and I don’t have time to write every day. I have to steal hours when I can. Reviewing music for a magazine means that I receive a bunch of CDs through the post, often only a week or so before the deadline, and I’ve somehow got to get my head around all this stuff enough to write something intelligent about it. I think you have to listen to an album at least twice before you can do that – more would be better, but it’s not always possible. I’ve actually just spent most of my Saturday banging out reviews for R2 magazine. I’m not complaining though, as the standard of the music has been very high. Is there a second novel in the works? There’s a second novel in my head which I have made a few notes for, but it’s not really “in the works” yet. The book, which is eBook only at the moment, is available from Amazon, Apple iBookstore, Barnes & Noble, Kobo, Sony Reader Store and more. Dr. Carolle was born and raised in Haiti to a family of healers, herbalists, midwives and shamans, and was educated in Haiti and the best universities in Mexico, Jamaica, and the US. After completing her postgraduate training in obstetrics and gynecology in Wisconsin she settled in San Diego in 1982. 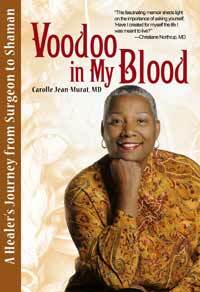 She soon was regarded as one of the best ob-gyn around-tall and regal, a lone black female among the elite. But her success harbored a secret: when a patient entered her office, Dr. Carolle could quickly and intuitively see the root cause of her patient’s illness, often times knowing she could help the patient without having to put her under the knife. She knew she dared not make these claims aloud. Struggling to fit in with the Western medical paradigm, her intuition and vision were best left unmentioned until she had no choice than to quit. In 2005, she built the Dr. Carolle’s Wellness and Retreat Center of San Diego, the only place in the world where you can get UNSTUCK by spending as much time as you want – a few hours, one day, or a weekend with her. She helps those who want to quickly discover the root causes of their disease, which usually are hidden emotions. She provides guidance on how to bring them to consciousness, and how to effectively deal with them. Dr. Carolle has worked extensively with female veterans who suffer from post-traumatic stress disorder (PTSD) due to sexual trauma during their military experience – MST, to include in-depth assessments, providing specialized alternative treatments, and testifying on their behalf at the Department of Veterans Affairs. In July 2012, she joined forces with Tara Wise, the founder of the National Military Women Veterans Association to help bring MST – military sexual trauma to the forefront. Dr. Carolle continues to provide free intuitive gynecological care to the people of Haiti and underserved women through Catholic Charities and St. Vincent de Paul Village with Father Joe Carroll, and Native-American Health programs. In 1993, Dr. Carolle founded the non-profit organization, Health Through Communications Foundationand its Angels For Haiti Project to provide the undeserved with education, health-care, and hope for the future. See www.HealthThroughCommunications.org. As an international motivational speaker, Dr. Carolle brings her message of self-empowerment to women through her award-winning books, CDs, DVDs, live workshops and training programs, radio, media appearances andvirtual events. Born and raised in Haiti to a family of healers, US trained physician Carolle Jean-Murat came to be regarded as a world-class surgeon. But her success har­bored a secret: in the operating room, she could quickly intuit the root cause of her patient’s illness, often times knowing she could help the patient without surgery. Dr. Jean-Murat knew that to fellow surgeons, her intuition was best left unmen­tioned. But when the devastating earthquake hit Haiti and Carolle returned to help, she had to acknowledge the shaman she had become. This mesmerizing story takes us inside the secret world of voodoo as a heal­ing practice, and sheds light on why it remains a mystery to most and shunned by many.